Continue without a save does not have special text and looks out of place. When trying to enter the bedroom, repeats it twice if you keep walking down, once when trying to return. Can walk around during conversations, which can be odd when shopping as the conversation doesn't break properly. Why are the lights on in the daytime? Battle timer shows wrong icon after tutorial battle. Once entering the swamp map, you cannot return to the main village as trying to leave puts you on the same panel to enter the swamp, looping you right back. Clearly unfinished and breaks immersion instead of finishing the quest that is started. While the gameplay was actually enjoyable for the most part, it wasn't spectacular. With a bit more polish, the battle system could be more enjoyable. Unfortunately, there are some issues with the game such as areas where you should not be able to pass, but can, or vice versa. While most NPCs will end conversation with you if you pass a certain range, some NPCs will keep talking and this can lead to some oddities such as a shop menu in an odd location or having the NPC repeat themselves when you are trying to do what they ask! The story is rather short, but the concept behind it seems to be solid. It isn't particularly amazing as it is a rather standard storyline, but what makes it slightly above average are the details that are often missed or ignored. Sadly, this only makes it slightly above average. The story doesn't have amazing graphics nor sound, but it makes use of them properly. This means that the world looks 'in place', which is important for immersion. There are a few oddities that could be improved upon such as the use of lights in daytime instead of conserving them for the night and sounds that seem to make no sense as to why they occur. Unfortunately, the game is cut off abruptly in an immersion breaking manner. Even without that, the game doesn't have a particularly strong draw as there are a lot of points where it seems like there isn't a strong tie. Essentially, there needs to be stronger immersion. This felt like the beginning of something pretty epic but then it just ended. A little hard to evaluate given its short length but the portion that is completed did a nice job of conjuring that classic RPG feeling. Music and atmosphere were also nice and the small town had a homey feeling to it. Interesting choice to use RMXP graphics in a VX Ace game, that always gets me nostalgic. 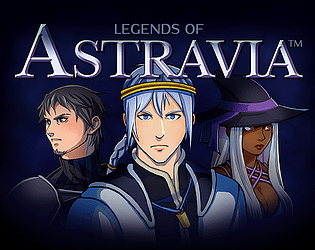 Legends of Astravia has now been updated to v1.1! A massive improvement over this IGMC demo. Thank you for your support, everyone. I've been meaning to get around to playing this one since you played mine as part of the Secret Santa thing we have going on in the forums. To start, you have a really great intro. It's a little tropey but hey, most of the best stuff is tropes done well and it seems like you're on the right track here. The mapping looks wonderful, very good use of lighting and fog effects, and it seem like you have a solid structure in place as far as mechanics are concerned. The music has a nice retro feel to it and suits the setting well. There's not a lot of actual game-play in this early version so I don't have a lot to work with as far as offering suggestions but here's a few. Odds are, you've already tweaked some numbers and fixed some things so I don't know how helpful this will be but here it goes. Once I entered the swamp, I couldn't get back to town. It just kept sending me back to the swamp when I transferred to the town map from that direction. There was a couple of tileset issues. Nothing major. For instance, if I am all the way at the bottom of the inside of one of the houses, I can walk in front of the shelf on the wall. If I'm one square up, I'm behind it like I should be. The bees just seemed like they had way too many HPs. Thankfully, they missed most of the time. I couldn't open one of the treasure chests. It said I had to open it from the front but there didn't appear to be any way to get to the front of it. Like I said, minor stuff. Very easily fixed if not fixed already. I like what you've got so far. I think your game is off to a really good start. Hey thanks so much for checking it out! There is definitely a much better build coming within the next couple of weeks. Indeed, all of the technical problems you mentioned (swamp entry, tileset issues, enemy balancing, chests) have already been fixed for the next version, but thank you for letting me know. I actually am planning to rework the intro just a bit, to make it a little less tropey (it also blasts by at mach speed and you can't read anything at the end lol). Your mapping is gorgeous, I'm blown away. I love how much effort you put into small things like putting candles out, animated waterfalls, and butterlies. Your shops and houses all have an amazing amount of detail. You have a very interesting story and characters so far and I am looking forward to seeing more. I can't wait to put out an updated demo! It will really shine in the attention to detail department, I hope. Thank you so much for your review, I'm glad you enjoyed it! Mapping is my specialty, so I'm very happy it's working out. I agree with all of your critiques. I have big plans for the story (bad guy has motives) but the intro narrative is definitely executed poorly and needs some work. I hope to add more interesting lore hints in the starting area too. All the nitpicky stuff I definitely agree with, and I've already fixed most of them for my next release. Thank you for the note on the prices though, as I missed that one. It will be fixed! The honesty and the positivity I've received from everyone gives me a ton of motivation to continue, so I really appreciate it. Uh oh, exposition text talking about prophecies! And I can’t speed it up! At least the people were skeptical of the prophecy. Sort of like how in the real world you get people now and then saying “well, the world will end on blah blah blah date because the ancient Mayans predicted it” and everyone else is like… Yeah, ok, you ain’t getting out of paying your taxes that easily. Also liked the mountain crumbling. The people running around in the town though sort of ruin it a little. Not quite sure what it is, but maybe it’s the randomness of their movement. Uh oh, a dark and evil wizard that has monsters emerged! Why does he want the prophecies from 100 years ago be completed? Wouldn’t that mean his own death? Is he that angsty? Decent dialogue exchange between the three characters you first meet, though not sure why the guy is like “what has become of Astravia” since Oliver was mugged – I mean, didn’t these people just endure like 100 years of brutal war that divided the entire world? A mugging seems pretty tame and mild in comparison. I am enjoying the mapping, definitely helps banish the horrible “everything is square” look one usually gets in these types of games. Did the practice combat – it’s interesting, but not sure what is up with Fury, didn’t seem to get any at all so couldn’t unleash that! Uh oh, the main character has amnesia! I like Baldric. He’s a salty one! He calls himself an old man, but the dude legit looks like he isn’t old enough to drink yet. Oliver says he should go to Valica to get back to his duties, but he doesn’t remember anything? How does he remember what his duties are? Not to mention he has been MIA for three months, I am sure he has since been replaced. Now I get to explore the town. I really like the mapping, but the impassable butterflies are a bit silly. Could just make them “above player”/"through". Interesting – the mayor says he forgot all about the chest out back and that I should take the items inside before the chest rusts away, indicating it has been there for some time. Yet, the bread inside is warm and the apples fresh! A monster snatched up Jennah and Baldric needs to get a drink at the inn first. No clue what I just watched, some dialogue that was a little bit angsty and a semi green area that I didn’t recognize. I am assuming Baldric ran into some sort of trouble? I had no clue the swamp was on the north end of the town (and that the town was RIGHT NEXT TO THE SWAMP, seems dangerous!) – interesting 4th wall breaking memo though about the possible bugs. The swamp is pretty laggy, lots of events moving around. Overall though I like the mapping, but the pathways could be a little bit bigger. Fought a couple of bees – seems a bit buggy (lol pun) because sometimes when their little face thing gets to the point where they get a turn, it just skips them and goes back to the beginning. Looking in my items, Baldric had given me 3 warm milks after the practice session, but they are not in my inventory. Who stole my damn milk?! Wow, considering how difficult it is to kill 2 bees, I definitely want to avoid combat as much as possible. I mean, I have armor and a shield, but only like 200 health and bees hit for 30 damage each and they get to go two times per my one turn pretty much. Not cool! Aaaand that’s it. I found the sign post where Baldric would otherwise be. This is a very short game! Overall thoughts - game definitely needs more! But I assume you already knew that part. It took me maybe 15 minutes to get to where Baldric planted his sign. But what you have here a solid presentation of what the game could potentially become. The dialogue is decent, the mapping is solid, the combat, if balanced, could be pretty good. I hope you run with it and keep working on this! Good luck! There's SO MUCH more I wanted to do with the first area that explains all of the wacky plot points I set up and didn't explain. But I really appreciate the honesty! It was a super rushed attempt to get something out, but I hope you'll check it out when I post an update fixing all the bugs, balancing, and consistency issues. I'll be checking out Unsung Heroes soon! No worries, your game certainly isn't a bad one, it just seems like it didn't have enough time to bake in the proverbial oven - but honestly, there are almost no games in this contest that don't feel like that in some respect or another! It didn't! Much more baking required...the dough was still raw. It was my fault for planning something so ambitious. My goal was to have that whole starting area & quest completed but...time was the enemy. I am glad people are giving me the same consensus: "Seems like it's good, if only there was more..." It really motivates me to continue the project, so thank you! This was cool! 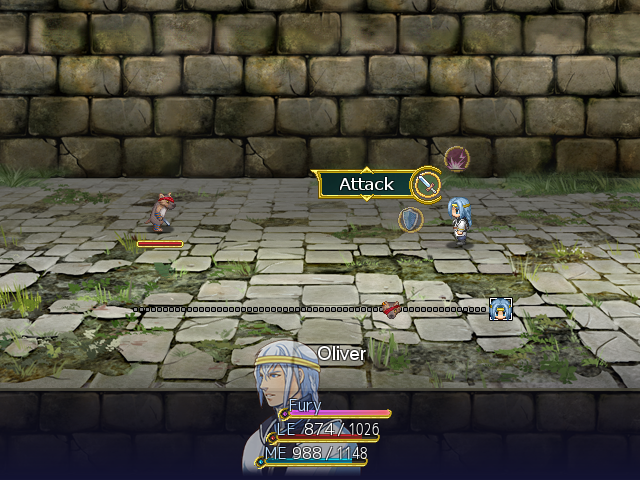 Aesthetically, it was really pleasing - and I like that we're using the same battle system! I will say that I hated the music that was used as I've heard it 800 times - but I'm excited to see how your project progresses! Thanks for checking it out! 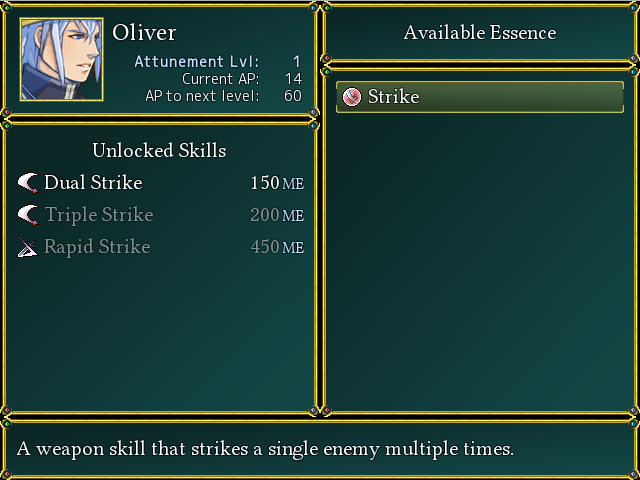 I really enjoy that battle system, though the XP version needs to be pretty much completely reworked. Original music is definitely #1 on the list of "things this game needs", so in time it will definitely be resolved. I'm super excited to continue it. I hate how little I have to offer for this contest, so I'm really going to try to add a lot of stuff for my next update. I think you were able to offer quite a lot! Maybe not in terms of gameplay - but in terms of stylization/branding you did a wonderful job. Whew, that's a relief to hear! Thanks. I definitely put a ton of time into stylization. There's at least 150 hours of work there...it was just a lot of back-end type stuff like the menu design, cutscene design, planning, scripts, etc that ate a lot of my time up. I think now that the base engine is almost where I want it to be, adding actual gameplay content will go much smoother! That was a close deadline hit! Hopefully it runs on everyone's computers well. If you guys have any trouble, please let me know!